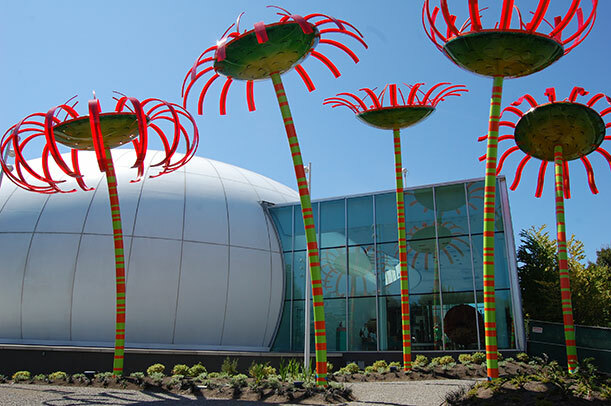 “Sonic Bloom,” a solar sculpture at the Pacific Science Center in Seattle. Photo courtesy of Dan Corson. “I was thinking about how some flowers move in order to capture the Sun,” says the artist. 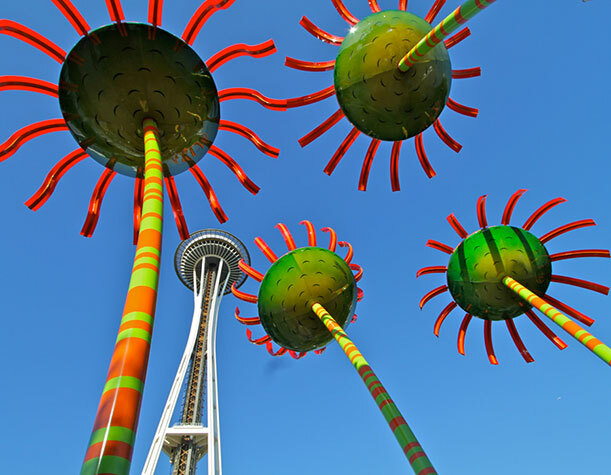 Corson drew up a plan for five towering sculptures of flowers, inspired by the flower of the Australian firewheel tree (Stenocarpus sinuatus), to sprout from the grounds of the science center near the base of Seattle’s famous Space Needle. The flowers would light up at night, thanks to electricity generated by day courtesy of solar panels on their faces. They’d also hum as people walked around the stems. “I also was thinking about science centers and how they reveal things to us that we normally don’t see—microscopically, atmospherically or phenomenologically. This led me down the path of imagining looking up and experiencing flowers from under them, as if you were the scale of a small insect,” he says. 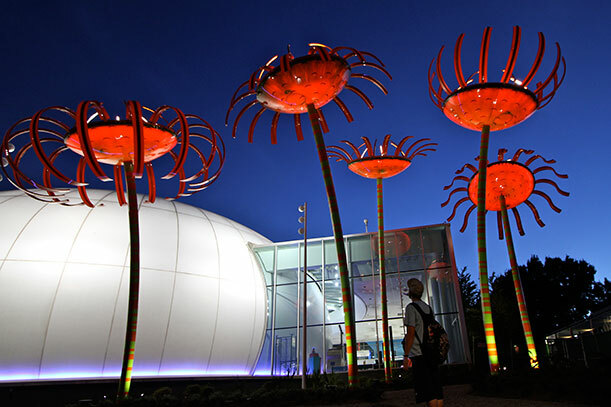 The Pacific Science Center selected Corson for the job. “He is very talented. Of all the artists, he had the most experience in solar,” says Michal Anderson, the center’s chief financial and operating officer. For example, Corson previously created a series of sculptures called “Nepenthes” in Portland, Oregon, that involve photovoltaic panels. The pieces collect solar energy during the day and then glow for four hours after sundown. So, after a few tweaks to the original plan, Corson created the playful installation, now called “Sonic Bloom.” Seattle City Light’s Green Up program, which sponsors projects that stir interest in renewable energy, provided the funds for the commission as a way to honor the center’s 50th anniversary. Corson modeled the flowers after those of the Australian firewheel tree. Photo courtesy of Dan Corson. The patch of brightly colored blossoms, unveiled last month after three years of planning, is a welcome sight. The flowers stand up to 33 feet tall with petals measuring 20 feet wide. All told, 270 four-watt solar panels, built by the Washington company Silicon Energy, are mounted to the tops of the flower heads. Directly under the solar panels, in fiberglass domes facing downward, are LEDs. At night, the LEDs change colors and the beams chase each other, creating a light show effect. Corson tilted the flowers at different angles and in different directions to show the effect of time of day and orientation on energy generation. Visitors can see real-time, daily, monthly and yearly electricity generation on a kiosk inside the center. “As you scroll through, you can see how different flowers are performing due to their angle,” the artist explains. The flowers are tied to the electricity grid, so their brightness is consistent over the five-plus hours each night that they shine. Despite Seattle’s notoriety as a cloudy city, “the amount of energy [created] is calculated over the whole year, so the flowers produce extra energy in the summer, and less in the winter, but overall, the project is energy neutral,” says the artist. During the summer months, that extra energy is used to offset some of the center’s energy needs. Corson is fascinated by light—so much so that he incorporates it into many of his public artworks. In Fort Lauderdale, Florida, he constructed a circle of lit trees he calls “Luminous Conjunction.” When a pedestrian walking along the laid brick sidewalk passes a tree, the spotlight illuminating it changes from white to green. Then, in “Rays,” an installation in Rivers Edge Park in Council Bluffs, Iowa, Corson created a nightly light show that projects lines, rings and swirly patterns on a five-acre grassy lawn. “Sonic Bloom” glows for more than five hours each night. Photo courtesy of Dan Corson.